Revista is published by the David Rockefeller Center for Latin American Studies at Harvard. Fall 2014 is devoted to Peru and includes the photo essay, Building a Template for Sustainable Forestry: Hope in a Landscape of Corruption. 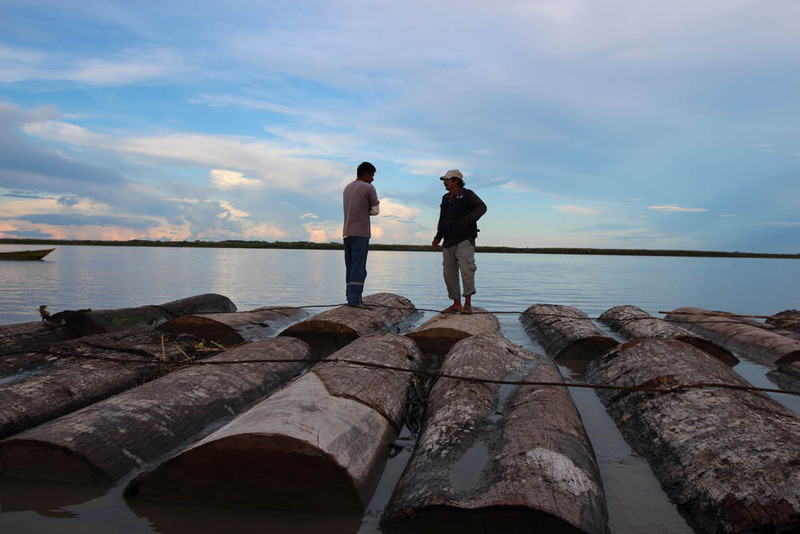 Jairo Huarash and Armando Espinosa stand on their raft of cut logs or boya. They lived on the raft for three days transporting their wood to a mill. Rio Ucayali, Atalaya Province. RIO UCAYALI, Peru— Sebastian Maringama snakes his way through an emerald wilderness. He’s moving through a thicket of old-growth forest flanking the Rio Ucayali in Peru’s northeastern Amazon. An octogenarian elder of the Ashéninka indigenous group, Maringama is dressed in a flowing gown with vertical stripes. Radiant, multicolored bird feathers adorn his headband. One hand clasps a bow hewn from tropical hardwood, the other a burnished leather quiver containing red-tipped arrows dipped in snake venom. Maringama’s hunt is a staple of life in this sweltering river village of 71 families. Wood framed thatched-roof homes sit on stilts. The songs of forest animals and birds meld into nature’s non-stop soundtrack. The place is aptly named Puerto Esperanza. This is a place of esperanza—hope—in a generalized context in which most communities do not manage their forests legally. The story of theft and resource mismanagement in Peru’s Amazon Basin is driven by foreign demand for quality wood, greed and domestic poverty. It is hard not to fall into the traps of corruption and illegality; the World Bank estimates that 80 percent of Peruvian wood exports are illegal. What’s unfolding in Puerto Esperanza represents a small but significant example of how environmental stewardship can translate into sustainable income. It also shows how a collaboration between the village and a private forestry company is reaping financial dividends for both. “Our neighbors are impressed by what we are doing here,” whispers Maringama in Spanish as he crouches on the forest floor. “We’re organized. We’re getting decent payment for this forest,” he explains. Three years ago, a private forestry company in Peru, Consorcio Forestal Amazónico(CFA) that has since finished operations in Peru, and the World Wildlife Fund (WWF) had each forged a relationship with the village. The company, owned by an investment fund in Denmark, was already working in a concession that bordered the village. WWF was also working in Puerto Esperanza helping villagers craft a business plan for their timber. The two entities share an interest in profitable, sustainable forestry. Their overlapping agendas set the table for an agreement that the parties hope will be a template for neighboring communities. CFA would pay all costs to harvest the trees. As it does in its own concession, it would promote forest growth, for example by cutting the forest canopy to allow sunlight to nurture tree seedlings. In return the community would receive 20 per cent of the harvested wood to sell. Villagers would choose which species they wanted to receive. That allowed villagers to select the timber that would produce the highest return from year to year based on prevailing market demands. CFA said it would not buy the village’s 20 percent share of the wood. The company reasoned independent transactions would forcibly move the village closer to self-sufficiency in both timber production and sales. The community agreed to the proposal. After two harvesting seasons, the community has received more than US$400,000 from sales of timber certified by the Forest Stewardship Council. Each family gets a share of the profit. The Council’s endorsement—“FSC-certified”—is the world standard that assures foreign buyers and environmental watchdogs alike that timber is legal and harvested responsibly. Obtaining that endorsement is an expensive, arduous process. Both CFA and the World Wildlife Fund helped the village obtain the FSC seal and create a business plan. “Some places near here have been robbed of their trees,” explains Sajame, recalling instances in which outsiders have swindled communities by paying them in cash for the right to cut trees for pennies on the dollar. In addition to illegal harvesting and theft of timber, the industry is also a crucible of violence. In 2008, a community leader was murdered in a government office after trying to alert authorities that stolen timber was being shipped through his territory. In 2009, at least 30 people died during protests against proposals to permit oil extraction, hydroelectric dams and logging across a swath of Peru’s Amazon Basin. Logging in Peru is the story of an intersection of forged documents, collusion between provincial politicians and timber interests and few options for employment. Enforcement is an inconsistent, opaque process in which transport permits—designed to track a tree from the moment it is felled to the point of sale—are widely available. Loggers who cut timber illegally in one area can easily buy a forged document showing the timber was cut somewhere else. A poll conducted by El Comercio newspaper (released February 17, 2014) suggests that more than 75 percent of Peruvians believe their police and politicians can be bought. 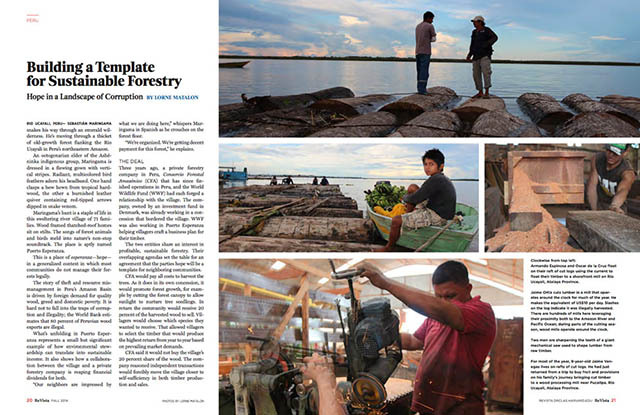 In Pucallpa, a river port teeming with saw mills, a man sits across the street from the office of Dirección General Forestal y de Fauna Silvestre, Peru’s forest service. The man has a stack of blank permits needed to transport logs and an ink-drenched stamp at the ready. Money changes hands, the thump of the stamp meeting paper echoes and the buyer, presumably someone who couldn’t get the necessary documents legally, walks away. The government claims to have no knowledge of this practice. But it’s common knowledge here and there’s no attempt to hide it. At the same time, the federal government has transferred policing authority in Peru’s forests to provincial forest service inspectors. They make the equivalent of US$350 per month, a salary that makes them vulnerable to corruption. Marcial Pezo, who heads the Pucallpa office of the forest service, succeeded Miguel Dávila Henderson who was forced out following embezzlement and fraud charges. Dávila is now a special assistant to a powerful regional governor. In Pucallpa people wonder openly about how an allegedly corrupt official can be hired for a high-level government posting. Pezo conceded corruption is an intractable problem and explained that his 55 inspectors are responsible for patrolling 14 million acres of rain forest. With outside help, villagers in Puerto Esperanza are trying to commercialize lesser known species such as huangana casha used in flooring and chamisa amarilla used for furniture. Asia that those species and several others are desirable. Both huangana casha and chamisa amarilla are blessed with some of the same qualities of durability and aesthetics that threatened species such as mahogany are famous for. At the same time, the United States has formally asked Peru to prosecute political and business leaders who violate a 2007 free trade agreement with the United States. That deal called for enforcement of existing laws against illegal logging. But enforcement is an abstract in many parts of the Amazon Basin. The legal framework to stop the theft of trees exists. In 2008, the United States amended the Lacey Act, passed in 1900 to ban traffic in wildlife and plants to include the import of illegally harvested timber. Peru passed a forestry law in 2011 designed to clamp down on illegal logging. But the law is mired in negotiations as the country decides how it should be implemented. Residents of Puerto Esperanza believe they stand as a positive example of change in an otherwise bleak landscape, one marked by flaunted laws and a nexus between politicians and timber interests. Peru’s vibrant economy is in large measure driven by commodities—minerals, oil and gas and timber. But as people in Puerto Esperanza say repeatedly, timber alone is renewable. Lorne Matalon is a staff correspondent with the Fronteras Desk, a collaboration of National Public Radio member stations reporting on the politics, demographics and economy along the U.S.-Mexico border. Matalon is the former reporter in Mexico for The World, produced by the BBC World Service and NPR member station WGBH, Boston. This entry was posted in Photography, Print and tagged Harvard, Peru, ReVista. Bookmark the permalink.